Early Watergrass (Echinochloa oryzoides) is a monocot weed in the Poaceae family. In Turkey this weed first evolved multiple resistance (to 2 herbicide sites of action) in 2009 and infests Rice. Multiple resistance has evolved to herbicides in the Groups A/1, and B/2. These particular biotypes are known to have resistance to bispyribac-sodium, cyhalofop-butyl, and penoxsulam and they may be cross-resistant to other herbicides in the Groups A/1, and B/2. Detecting ALS and ACCase herbicide tolerant accession of Echinochloa oryzoides (Ard.) Fritsch. in rice (Oryza sativa L.) fields. 2014. Emine Kaya Altop, Husrev Mennan, Jens Carl Streibig, Unal Budak, Christian Ritz. Crop Protection 65 (2014) 202-206. Field, Greenhouse, and Laboratory trials comparing a known susceptible Early Watergrass biotype with this Early Watergrass biotype have been used to confirm resistance. For further information on the tests conducted please contact the local weed scientists that provided this information. There is no record of differences in fitness or competitiveness of these resistant biotypes when compared to that of normal susceptible biotypes. If you have any information pertaining to the fitness of multiple resistant Early Watergrass from Turkey please update the database. The Herbicide Resistance Action Committee, The Weed Science Society of America, and weed scientists in Turkey have been instrumental in providing you this information. Particular thanks is given to Emine Kaya Altop, and Hüsrev Mennan for providing detailed information. H. Mennan, E. Kaya-Altop, S. Rasa, J.C. Streibig, D. Yatmaz, U. Budak, D. Sariaslan. 2013. Resistance to ACCase and ALS inhibiting herbicides in cereals in Turkey; What have we learned?. EWRS 16th SYMPOSIUM, Samsun 2013 : . The herbicides are very effective tools for controlling weeds but their extensive use over time has resulted in evaluation of weed resistance to herbicides with different modes of action. ACCase and ALS inhibiting herbicides have been used extensively in winter wheat and rice fields to control grass and broadleaved weeds since last two decades in Turkey. Recently, many growers in various area of Turkey complained for reduced control ofBifora radiansandGalium aparinein winter cereals, andEchinochloa spp., andCyperus difformisin water seeding rice after use of ALS and ACCase inhibitor herbicides. Therefore, the aim of this study are to understand the occurrence and frequency of resistant biotypes of these species to ACCase and ALS inhibiting herbicides; does the mechanism of resistance are target site (TSR) or non-target site resistance (NTSR), risk assessment of herbicides history in evaluation of resistance and how crop rotation reduce selection for resistance? Forty-three rice fields were sampled randomly in 2005 to confirm the existence of cross and multiple herbicide resistance ofE. oryzoides,E. crus-galliandC. difformisinvolving ALS (penoxsulam, bispyribac-sodium) and ACCase Inhibitor (cyhalofob-butyl). The same and more fields re-sampled in 2011. In addition to that, greenhouse experiments were conducted from 1995 to 2011 to monitor possible resistance populations of B. radians andG. aparineto ALS inhibitor (chlorsulfuron and tribenuron-methyl) sampled from 13 winter wheat fields. A log-logistic dose-response curve was fitted to greenhouse data ofE. oryzoidesto obtain ED90. On the basis of those data, resistance to ALS inhibitors was detected in 2 accessions in 2005. On the other hand, allE. oryzoidesaccessions were susceptible to ACCase Inhibitor in the same year. The effective dose response level of ED90resulted in 36 and 9 resistant accessions to ALS and ACCase, respectively after re-sampling from same fields in 2011. Most of E. crus-galli accessions were effectively controlled with penoxsulam and cyhalofob-butyl in 2005. But, 4 accessions did not controlled with bispyribac-sodium and these accessions were characterized as resistant. The number of resistant accession significantly increased in 2011 and reached almost 75% in both inhibitors. Of the 43 C. difformis populations tested, 11 survived after treatments of penoxsulam and bispyribac-sodium in 2005. But, the application of four times recommended rate of these herbicides resulted only 3-5% fresh weight reduction of 40 C. difformis populations in 2011. The remaining 3 population with no evidence of penoxsulam and bispyribac-sodium resistance were controlled with almost double dose of these herbicides. A significant proportion of the populations in all species were found to be non-target site resistant..
E. Kaya–Altop, H. Mennan. 2013. Determination of ALS-Accase Herbicides Resistance Biotypes by Molecular and Bioassay Methods and Genetic Diversity of Some Important Weed Species in Rice Growing Areas. TUBITAK TOVAG PROJECT REPORT : . Rice is an important crop for Turkey, but its current production is so low that yearly 100-150 tons are still imported. Weed control has been a major concern of growers since the beginning ofOryza sativaproduction in Turkey as well as other countries. Continuous use of a herbicide or herbicides with the same mechanism of action leads to the development of herbicides resistance in weed population. Rice is seldom rotated with other crops in many part of Turkey, and the few available grass herbicides have been used continuously to controlEchinochloaspecies. Recently, farmers have complained of unacceptable control ofE. oryzoidesandE. 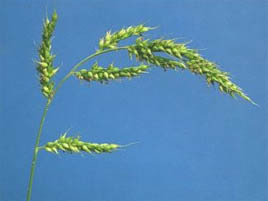 crus-galliin rice by herbicides that previously controlled them. The taxonomic complexity of Echinochloa species are other problem. Conventionally identification of this genus is sometimes difficult because of the morphological diversity shown by the genus. Molecular techniques have opened new possibilities for taxonomic researches, especially for the species which are not well characterized morphologically. Seed samples ofE. oryzoides, E. cruss-galli,C. difformisandA. plantago-aquaticahad been collected from 679 fields randomly including areas where control problems had been detected. Firstfull,Echinochloaspecies were idifiefed based on moleculer techniques. As a result of this study 465, 124 and 90 accessions were identified asE. oryzoides, E. cruss-galliandEchinochloaspp. respectively.E. oryzoides, E. crus-galli,C.difformisandA. plantago-aquaticawere tested for resistance to penoxulam, chylafob-butyl, bispyribac-sodium, bensulfuron-methyl and azimsulfuron at registration doses in greenhouse. Some accession exhibited the highest survival to treatment with field rates of these herbicides. The Weibull dose-response curve, an asymmetric sigmoid curve, was fitted to data to obtain ED90in R program. Most ofEchinochloaaccessions tested did not controlled by ALS or ACCase inhibitor and they were accepted as a resistant population cross-resistance to ALS and ACCase Inhibitor. Similiar results were observed for C. difformisandA. plantago-aquatica. Most of their accessions were not control by ALS Inhibitor..
Lee InYong ; Kwon OhDo ; Kim ChangSeok ; Lee JeongRan ; Moon ByungChul ; Park JaeEup. 2012. Control of herbicide resistant Echinochloa oryzoides with pre and post emergent herbicides based on the leaf stages. Pakistan Journal of Weed Science Research 18 : 309 - 315. The effect of weed control was investigated, based on the leaf growth stages and/or several different herbicide treatments, for an integrated weed management of herbicide resistant Echinochloa oryzoides in a rice field. The effectiveness of soil-applied herbicide treatments for pre-emergent control of E. oryzoides resistant to herbicides was very high with oxadiargyl 1.7% EC, oxadizon 12% EC, and fentrazamide.oxadiargal 3.3% EC. Pentaxazon 5% SC achieved over 98% of weed control, although some E. oryzoides emerged 31 days after the treatment. Up to the 2nd leaf growth stage of E. oryzoides, six herbicides, azimsulfuron.carfenstole 1.05% GR, bensulfuron-methyl.benzobicyclone. mefenacet 24.52% SC, bensulfuron-methyl.fentrazamide 7% SC, bensulfuron-methyl. mefenacet.oxadiargyl 21.6% SC, benzobicyclon.mefenacet.penoxulam 21.5% SC and mefenacet.pyrazosulfuron-ethyl 3.57% GR achieved 100% control. However, only two herbicides, benzobicyclone.mefenacet.penoxulam 21.5% SC and mefenacet. pyrazosulfuron-ethyl 3.5% GR could control E. oryzoides up to the 3rd leaf growth stage. The study indicates that it is very important to select the right herbicides for treatment and apply them at the correct timing to achieve a high level of control of E. oryzoides resistant to ACCase- and ALS-herbicides..
Lee InYong ; Kwon OhDo ; Kim ChangSeok ; Lee JeongRan ; Moon ByungChul ; Park JaeEup. 2011. Control of herbicide resistant Echinochloa oryzoides with pre and post emergent herbicides based on the leaf stages. : 263 - 269. Osuna, M. D. ; Okada, M. ; Ahmad, R. ; Fischer, A. J. ; Jasieniuk, M.. 2011. Genetic diversity and spread of thiobencarb resistant early watergrass (Echinochloa oryzoides) in California. Weed Science 59 : 195 - 201. Resistance to the thiocarbamates has been selected in early watergrass populations within the rice-growing region of California. To elucidate the processes contributing to the spread of resistance among rice fields, we characterized the genetic diversity and differentiation of thiobencarb-resistant (R) and thiobencarb-susceptible (S) populations across the Central Valley using microsatellite markers. A total of 406 individuals from 22 populations were genotyped using seven nuclear microsatellite primer pairs. Three analytical approaches (unshared allele, Shannon-Weaver, and allelic-phenotype statistics) were used to assess genetic diversity and differentiation in the allohexaploid species. Low levels of genetic variation were detected within populations, consistent with other highly selfing species, with S populations tending to be more diverse than R populations. FST values indicated that populations were genetically differentiated and that genetic differentiation was greater among S populations than R populations. Principal coordinate analysis generated two orthogonal axes that explained 88% of the genetic variance among early watergrass populations and differentiated populations by geographical region, which was associated with resistance phenotype. A Mantel test revealed that genetic distances between R populations were positively correlated with the geographical distances separating populations. Taken together, our results suggest that both short- and long-distance seed dispersal, and multiple local and independent evolutionary events, are involved in the spread of thiobencarb-resistant early watergrass across rice fields in the Sacramento Valley. In contrast, resistance was not detected in early watergrass populations in the San Joaquin Valley..